Home › Analysis › Antoine Griezmann signs to Atletico Madrid : for better or worst ? A teenage boy, aged 13 left his hometown Mâcon (Alsace, France; hence his german sound surname), for no Youth Football Academy wanted him as student; 10 years later, after shining with France’s first team in World Cup 2014 Antoine Griezmann courted by big spenders AS Monaco, PSG and Premiere League’s Tottenham, signed to Atletico Madrid, for 30M euros transfer fee. During these last 10 years spent in Real Societad’s Basque Province, the young Frenchman played 202 games ( in 5 seasons) with the first team, scored 53 and won the 2010 UEFA European Cup under -19 with his national side. After the end of the World Cup, Griezmann’s condition changed from a promising youngster, to an attractive “must have” player. Who’s still thinking about the year and half banishment from all French National teams, because of his foolish night at a Parisian night-club, just two days before a crucial game with France’s under -21 ? The ban finished just 6 months before ” le Mondial” just in time to enter in the senior team and get his Brazilian ticket! The young international rejected Ligue 1 offers ; was it because he still feels bad about being rejected , because of his average height ? After 10 years in Spain, Griezmann seems happy to continue his player’s career with last season’s Champions League finalist and play in Champions League, a player’s dream, that Tottenham couldn’t offer. Becoming a “Colchonero” is very flattering and exciting but what future for a young inexperienced player in a big club as Atletico Madrid? Will he be a first choice for boss, Diego Simeone ? Fortunately for him, he’s able to play not only in the middle, but he can also play as Left or Right Winger. The arrival from Bayern’s Munchen, Mario Mandzukic (Croatia) could be an interesting association for Simeone’s plans.”Griezmann “is a very good and fast player, declared Atletico’s boss, he also can bring different offensive solutions”. 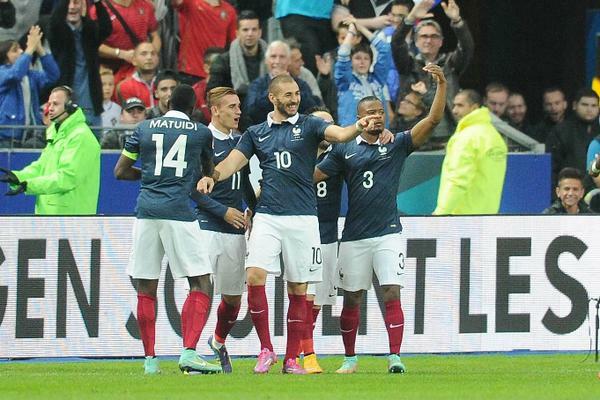 Didier Deschamps,” Les Bleus” boss, will also be attentive on Griezmann ‘s evolution; Euro 2016 isn’t far away. ‹ TRANSFER NEWS : Ospina, Di Maria, Lovren, Griezmann….